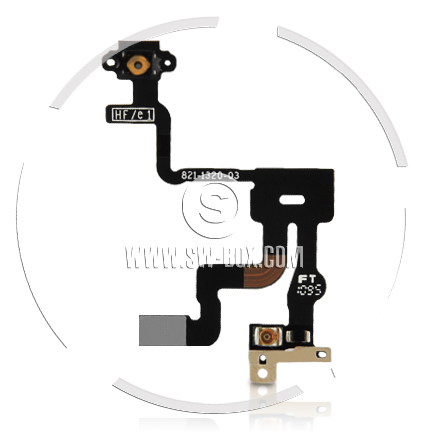 An alleged iPhone 5 proximity sensor part with subtle differences from the current generation has emerged on an accessory importer site. SW-Box.com claims to have obtained a genuine iPhone 5 proximity light sensor flex cable in advance of the device's launch, which is expected this fall. The site boasts that its offices are "just a stone's throw" from "the Apple factory," presumably a reference to contract manufacturer Foxconn's plant in Shenzhen, China. "We spend a lot of resources on research and intel," the company wrote on the part's product page, asserting that the component is indeed the "real deal." The part's pricing starts at $3.77 and goes as low as $2.52 for volume orders of 50 or more. According to the site, the flex cable is "evidence of solid engineering" and is "micro-architectured to stand the tests of time and heat." The part also contains "dynamic light sensing diodes and high flow terminals" that balance functionality and cost. The part contains minor differences in the orientation of the components as compared with a corresponding iPhone 4 part, possibly providing evidence of at least a partial redesign in the next-generation iPhone. One difference appears to be the fact that, as with the CDMA iPhone 4, the noise canceling microphone has been moved off of the proximity sensor part. Reports disagree on when the iPhone 5 will arrive. Earlier this week, it was claimed that wireless carriers have received iPhone 5 prototypes for testing ahead of an expected September launch. However, a separate report from John Paczkowski of All Things D claimed that rumors of a September launch are wrong, with the device not slated to arrive until October. Meanwhile, analysts have set much stock in intentionally vague comments from Apple hinting at a "future product transition" that will take place during the September quarter. Apple CFO Peter Oppenheimer made the remarks last month in response to a question on why the company's guidance forecast a 12 percent revenue decline in the third quarter of calendar 2011. It is widely believed that the iPhone 5 will include an 8-megapixel camera and the A5 processor. The device is also said to be thinner and lighter than the iPhone 4.